Image © Ahoy Comics. Credits as shown. 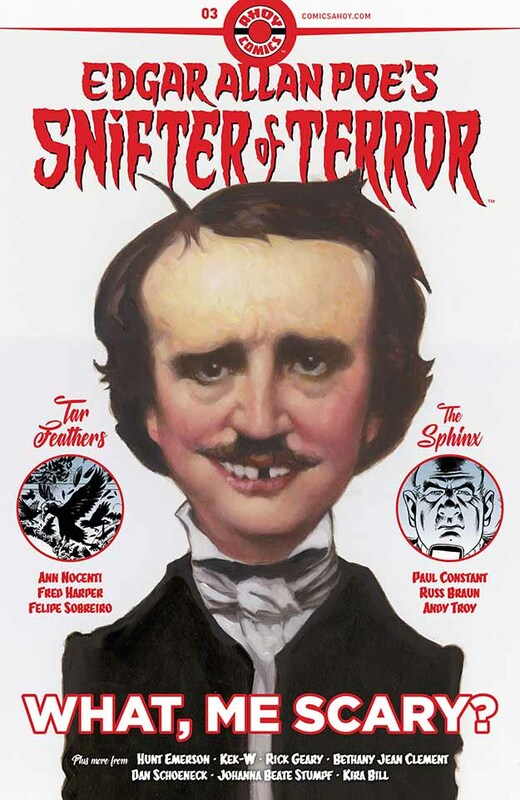 There’s something more disturbing than funny about using Poe himself as not one but two characters in the first story in this issue, “Tar Feathers.” It’s a very odd story in general, but with a surreal atmosphere that works pretty well as a balance between humor and horror. The writing by Ann Nocenti and the art by Fred Harper are both excellent. and this look inside a madhouse where the inmates have taken over is never predictable. I have no idea how it relates to the Poe source material, as I haven’t read it, but it’s pretty creepy. Alcoholism continues to be a theme both for Poe the host and the main character in the second story, “The Sphinx,” which I have vague memories of, and they were nothing like this. It’s a modern horror tale in every way, with satirical takes on the film industry and giant bug movies. It doesn’t exactly end as much as stop, but the Poe framing sequence is fun. Again, great art by Russ Braun. This entry was posted in Comics, Reviews on January 14, 2019 by Todd.